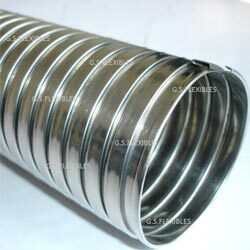 GS Conveyor hose is fully interlocked hose furnished without packing. It can be axially extended, compressed and fall back on itself without any application of force. At the same time fully interlocked construction imparts great crush resistance and high tensile strength. The GS Conveyor is manufactured out of Galvanized Steel as a standard. It is also available in Stainless Steel upon request. No. Nominal Inside Diameter Nominal Outside Diameter Min. Bend Radius Weight Per Ft. The lightweight, high flexibility, excellent crush resistance and good tensile strength make it an ideal protective casing. It is very durable in chemically corrosive environments .It is widely used to offer mechanical protection to large diameter wires and cables. Besides it used for the protection of non-metallic hoses and as additional armour to Stainless Steel Corrugated Hose. It is also used for discharge of dust particles, small pallets or hot air at atmospheric pressure.